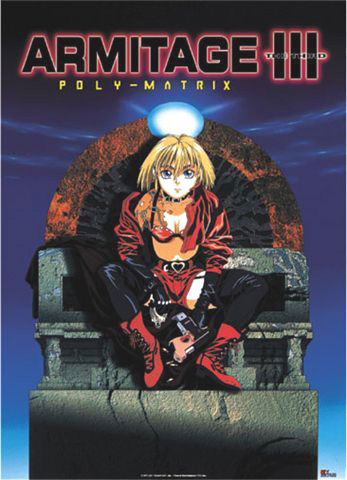 FUNimation(as of July 2, 2010), AIC/Pioneer Ent./Animaze Inc.
Last I checked, this anime was available on DVD at Amazon, and on VHS at Amazon. The above info came from Adam, and was edited by yours truly (contact me). The image came from Toys N Joys Online. Mars 2046, recently terraformed into the next vestige of human expansion. A planet where humans and robots live together admidst all the splendor of modern technology. This is the new home for Detective Ross Sylibus, and he has discovered all is not well in this crimson utopia. Paranoia against robots is growing at a frantic rate. Mass burnings of robots by massive lynch mobs has become commonplace. To make matters worse, gruesome murders of a new unlicensed robot have suddenly started. This new type of robot dubbed 'thirds' is a radical step forward in robot technology. They are designed to emulate humans in everyway including emotions. They are virtually undistinguishable, except when they have had a few holes blown into them. The above description came from Adam, and was edited by yours truly (contact me).